I talk about food. Too much. Yesterday I even had a little conversation on Instagram about how to prepare millet. Cooking millet is one of the first cooking skills I ever learned. When I bought my first cookbook (Vegetarian Cookery by Rose Elliot) I picked up a little trick that changed everything. No more mushy millet, I swear! Before you cook millet, you have to toast it. Toasting the grain does not only improve the flavour, it also helps to absorb more liquid during cooking. Just place it in a small saucepan and toast it until golden brown, stirring constantly. Then remove from heat and carefully add the cooking liquid. Some other tricks for fluffy millet are: do not stir during cooking. Once the millet is done, remove the pot from heat and let it sit covered for 5-10 minutes, then fluff with a fork and serve. 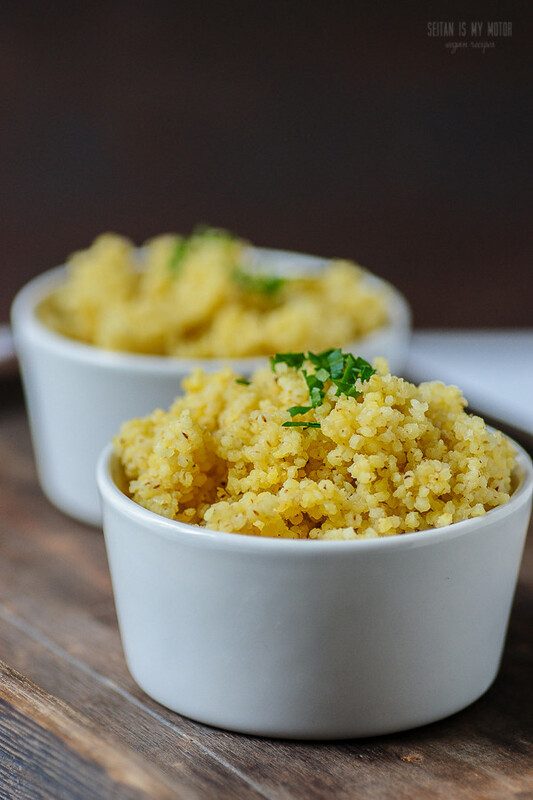 Place millet in a small saucepan and toast the millet until golden brown. Stir constantly. This should take about 5-10 minutes. Remove from heat, carefully pour vegetable broth into the pot, stir and cover. Simmer for 15-20 minutes over medium heat until the liquid is absorbed. Remove from heat and let sit covered for 5-10 minutes. Fluff with a fork and serve (for example with potatoes and plantains). 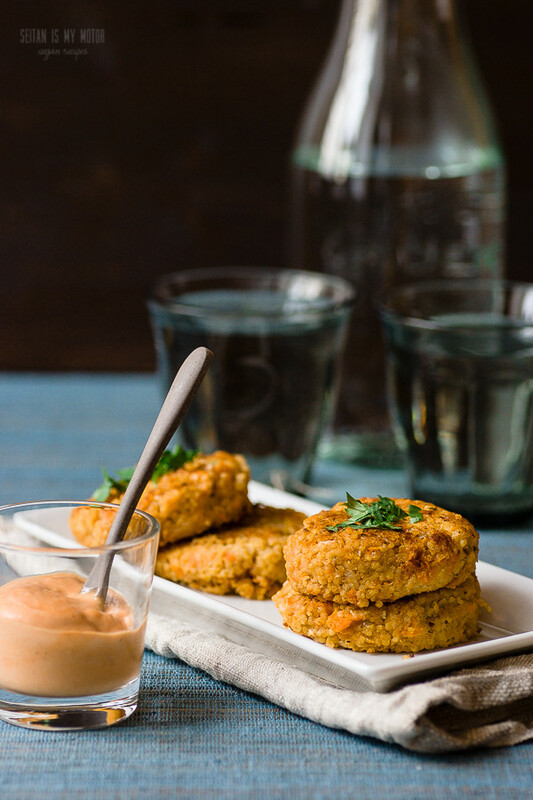 If you want more than a basic grain side, millet patties make a great appetizer or snack. To prevent them from falling apart, you don’t want your millet fluffy though. In this case it should be mushy. You should also skip toasting the millet and you need to cook it with more vegetable broth or water. Stirring it often will give you are porridge like consistency and makes the patties easier to handle. Prepare the patties: Place millet and broth in a pot and bring to a boil. Simmer for about 15-20 minutes or until the liquid is absorbed. Stir every couple of minutes. While the millet is cooking, fry garlic, onion, celeriac root, and carrot together with the salt in a small pan for about five minutes. Remove from heat. Combine lupin flour and water and whisk until creamy. Add fried vegetables, lupin flour mixture, and spices to the cooked millet. Stir well and sprinkle with 1 tablespoon flour. Mix one more time and carefully form 8 patties. Add more flour if necessary. Heat a large non-stick pan and add 1-2 tablespoons of vegetable oil. Carefully place the patties in the pan and cook for 5 minutes over medium heat. Turn them very carefully and cook the other side. Let cook for about five minutes before serving and serve with dip. These are also great when eaten at room temperature. Prepare the dip: Combine mayonnaise and hot sauce and stir well. Ich Freu mich, wenn du übers kochen spricht und dabei gleich alle meine Probleme gelöst werden! Danke für die tollen Tipps. I love millet and almost never cook it. Why? Nobody knows. Great tips! Those patties look so good! There is a vegan soul food restaurant here in Detroit that makes yummy millet burgers. Same for me – I’ve only had millet a few times but now I want to pick some up! The patties look very original and delicious.